The Snoop Dogg Micro G Vaporizer combines both; stealth and style in one portable and affordable package. 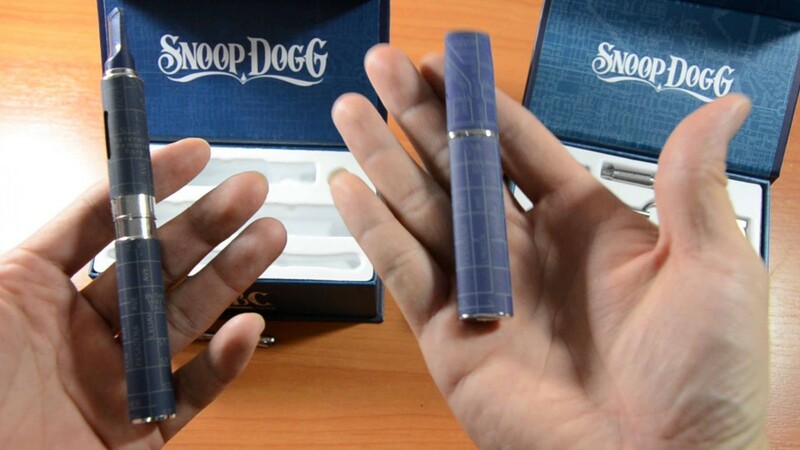 Snoop Dogg’s newest vaporizer line features two different models. One is called, “G Pen Herbal.” Whereas, the other one is called, “Micro G Herbal.” The main difference between the two vapes is size. The micro pen G vape pen comes in a small form factor that offers more portability and stealth than the regular “G Pen Herbal” counterpart. Does Snoop Dogg’s latest offering live up to the hype? Below we will discuss a full detailed review of both of these vaporizer options and we will determine whether or not they are worth your time. The first thing I noticed with the G pen is the excellent packaging. This is definitely a product that screams premium quality and class. The box sports a matte finish with an eye-catching sharp logo. Unlike many vaporizers on the market that have little to no design sense in their packaging, the G pen is packaged to showcase it as an artful piece of technology. There is truly a merging of vaporization tech and art in this vaporizer. 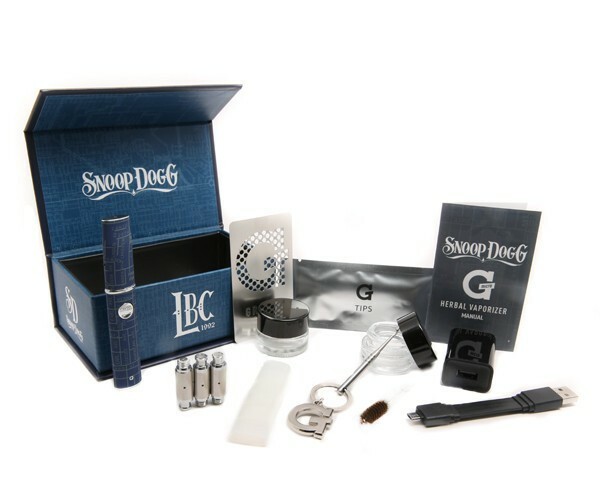 The Snoop Dogg G Pen package includes everything that you would expect to come with a portable vaporizer. This is a great starter kit and gives you everything that you will need in order to get started using your G Pen today. I was glad to see an extra glass sleeve and a few extra tips which, as I’m sure you will see, come in very handy. 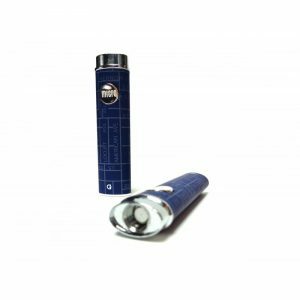 The G Pen is designed with a blue map pattern that features the streets of Long Beach which is where Snoop Dogg is from. 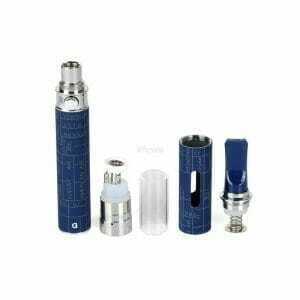 From the Long Beach street patterns to the iconic blue, black, and silver colors presented throughout the device and it’s accessories a sense of build quality and design are merged to make this vape usable and stylish. The G pen features a nice matte/rubber finish which allows for a tight grip and great control when handling the pen itself. 3 hour charge time when it is fully dead. Before we begin vaping it is important to note that with any vaporizer you will get different results depending on the consistency of the herbal material. For the best results, I find grinding the material will help to evenly vape materials, make stirring far easier and needed less frequently. The G Brush tool that is included is perfect for tamping down herbal materials and stirring. I experimented with packing the material tightly and then loose and found that medium packing can help to vape the material a little better and I encourage you to experiment with this and let me know what results you are getting. In order to turn on and begin using the G Pen vaporizer, you need to actually press the power button a full 5 times. A lot of people may be thinking that this takes too much effort. But the fact remains, you do not want the G Pen lighting up in your pocket. This unit gets pretty hot to the touch and has a pretty powerful heating element, so the 5 press activation style is perfect to protect you from being burned during transport or while not in use. During our test period, the device vaporized without a hang-up. You can tell that this device was designed for quick performance as it heats up almost instantaneously. I was skeptical of a vaporizer using Snoop Dogg’s name and brand thinking it gimmicky but was pleasantly surprised at the immediate result that I got from the unit. This isn’t the smallest package in the world. 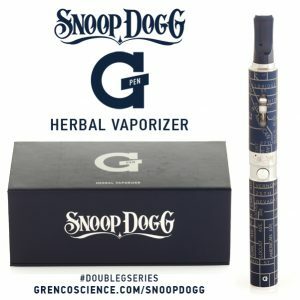 So if you value small sizes and stealth styled devices more than the quality of the overall vape, you might want to check out Snoop Dogg’s mini version of the G Pen. Disclaimer: Snoop Dogg G Pen may heat aromatic blends past the point of vaporization. During my test run of this unit I did not notice this what so ever, but in using the G Pen later I did notice material cherry up a little in the chamber. The unit reaches such a level of heat to begin combustion. and although I haven’t had a problem with this at all, some may consider this a bit harsh on the lungs from the heat, and if this unit begins to burn your material you are not necessarily getting the full benefits of vaporization if burning begins. The G Pen is incredible value with its price point coming in under $100. This may not be the most advanced vaporizer on the market, but for under $100, it packs enough punch to get you to get you by. 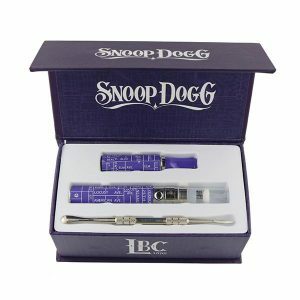 The Snoop Dogg G Pen can vaporize oils and herbal materials, it heats almost instantly and is perfect for taking a puff quickly without making a big deal out of it. A friend of mine uses it at work in his factory job and is able to take a puff on a break and exhaling by a blower near one of the machines without anyone noticing what so ever. If you are looking for a compact vape great for on the go and easy to conceal the Micro G may be for you. Below we will feature our review of the Micro G Herbal and whether or not it lives up to it’s bigger brother. There is no surprise in the packaging of the Micro G Herbal. It pretty much looks and feels just like it’s bigger brother. The packaging is premium and has a classy look/feel to it. The biggest difference in the packaging is the way that the contents are laid out. Obviously, this has no effect whatsoever on the actual product. 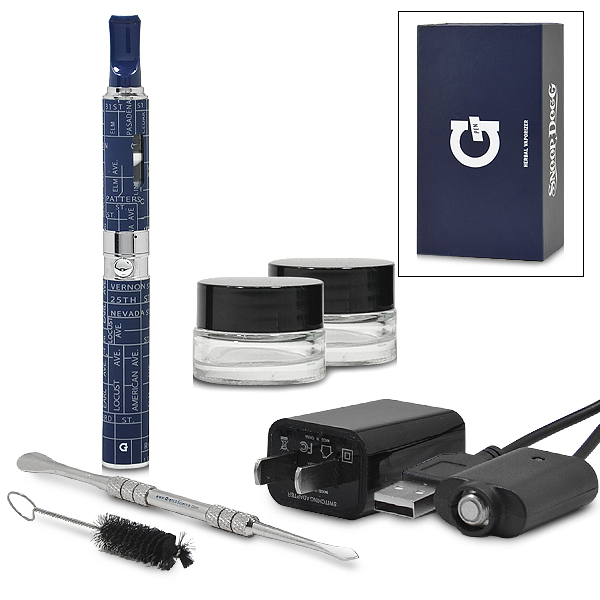 The micro G pen comes with a full array of accessories for charging, cleaning and use. Everything you need to get started is included and the only notable difference from the G pen is a shorter charging cord. Let me first explain that the Micro G is the essence of simplicity and is very easy to assemble. The first thing I noticed is that the tanks that come with the micro are dramatically smaller than it’s larger brother’s tanks, this helps to keep the Micro G form factor to a minimum while remaining usable and stealthy. It is definitely a lot smaller than the original version. Therefore, if you are looking for a compact vaporizer, this is definitely right up your ally. Snoop Dogg wanted to make sure that the vaporizing experience was going to be identical on both of the devices. Grenco Science managed to pull it off from the looks of it. During our review, we found it very difficult to distinguish which vaporizer was superior because they performed nearly identically. The Unit heats almost instantly and produced large clouds at the push of a button. This is quite the achievement given that the device clearly had to sacrifice a ton of size in order to get it in such a small form factor. The Micro G is priced roughly 10$ cheaper than the G pen coming it at around $75 dollars before shipping. Again for a unit under a $100 I was quite pleased with its performance and size really is a deciding factor with this unit. Snoop Dogg has been open about his smoking habits for some time and knows that not everyone wants to be so out in the open about their own vaping habits. So this unit was definitely designed with convenience as well as concealment in mind and both of these qualities make this unit not only useful in vaping but they actually look pretty cool. When putting toe to toe both units produce relatively the same size clouds, both get to heat almost instantly and both are stealthy and sleek. If you are looking for a compact vaporizer under $100 that does not sacrifice performance for size, this is likely going to be your best option currently on the market. Not only is it incredibly good at what it is designed to do, but it is also in a premium package that simply looks and feels like it will last a long time. If you are a fan of Snoop Dog and you are looking for a vaporizer, the Snoop Dog vaporizer is simply a no-brainer. Although both devices run a little on the hot site, they produce great clouds and we truly enjoyed working with them. 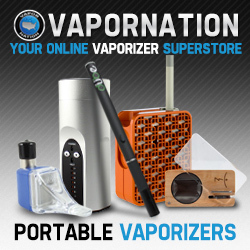 We would recommend them to virtually anyone that is looking for a high class vaporizing experience for under $100. If you are looking for a higher end vape, you might want to look into some of the other vapes we have reviewed. But if you are looking for a beginner vape or something for on the go or that is easily concealable, this is clearly one of the best devices on the market. 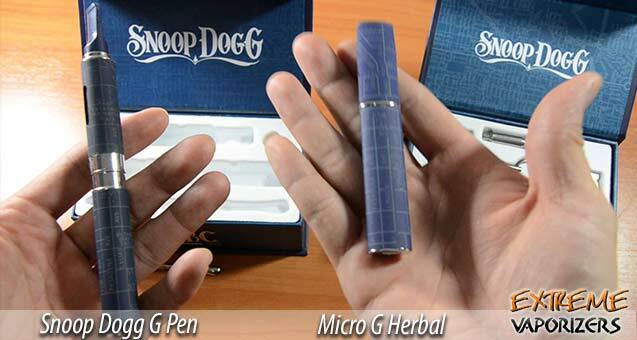 You can find the Micro G Vaporizer here and the Snoop Dogg G Pen here.